The KONG Air Squeaker Donut is designed to combine two toys: a tennis ball and a squeaky toy. The KONG Air Squeaker Donut is designed to combine two toys: a tennis ball, and a squeaky toy. The donut-shaped toy can also be used for playing fetch. 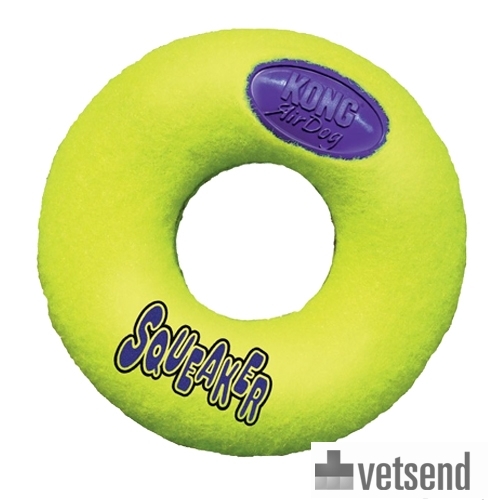 The KONG Air Squeaker Donut is made from non-abrasive felt, which will not damage your dog's teeth, in contrast with the abrasive material of regular tennis balls. The squeaker is useful for encouraging play, and the toy also floats on water. Also available from the same range is the KONG AirDog Squeaker. Have you used KONG AirDog Squeaker Donut before? Let us know what you think about this product.